A photo from a SPECTRE wardrobe sheet reveals the vintage Omega chronograph. The Omega Chronograph watch can only be seen for a split second in SPECTRE, but the details match the photo on the wardrobe sheet. 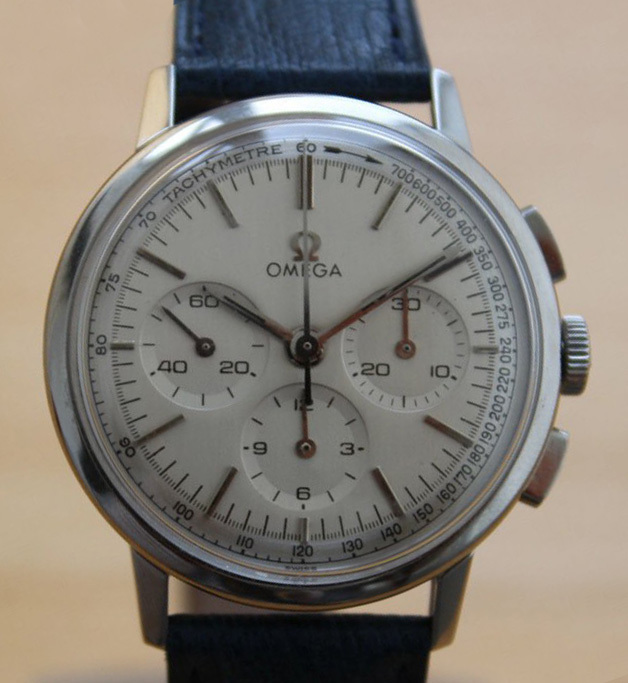 As already suggested by some fans*, the watch is indeed a vintage Omega Chronograph with Caliber 321 from the mid-1960s. The exact model reference number is ST 101.010. The watch is from 1965, the same year as the Aston Martin DB5. A copy of a wardrobe sheet shows a photo of the watch (see image on the left). The watch has a steel case, and silver dial with Baton hour markers and three silver subdials. The outer ring features a Tachymeter scale. The watch has a crown and two flat push buttons on the right side of the case. The strap is black leather with canvas sail / sailcloth look. If you search for this watch model you might find different variations of the Omega logo, especially the size of the text in relation to the Omega sign. The Omega Chronograph watch can only be seen for a split second in SPECTRE when Bond drives away in the DB5, but the details of the watch seem to match the photo on the wardrobe sheet. This model vintage Omega Seamaster is hard to find, and also the exact model number / year is not known making it hard to find the same model. This is the third Omega watch worn by James Bond in SPECTRE. In the first scene in Mexico, Bond wears an Omega Aqua Terra 150M Master Co-Axial, of which a special James Bond edition was released by Omega. Q gives Bond an Omega Seamaster 300 SPECTRE Limited Edition in the film with some special features. The outfit worn by Bond in the last scene is a three-piece charcoal grey small check suit by Tom Ford, a pale blue cotton shirt with French cuffs by Tom Ford, a pale blue pcket square, a black silk find necktie by Thomas Pink, and the Dents black leather Driving Gloves (same gloves as worn in the Rome scenes). Probably Bond also wears the Tom Ford JB cufflinks, but this is not confirmed. * AJB Forum member Stefan was one of the first fans to ID this watch perfectly way back in January 2016; Allen posted a message on Bond Lifestyle in February suggesting it was a 321 Calibre, and rcs914 also got it right in May on the Omega Forum.